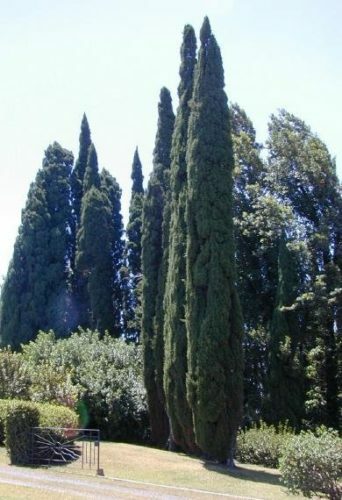 Cupressus sempervirens, as described in 1753 by Carolus Linnæus (1707–1778), is commonly known is Mediterranean, Common or Italian cypress. The epithet, "sempervirens" translates into "always green" in the Latin language. Description. Mediterranean cypress is an evergreen coniferous species of tree that grows to mature heights of 65 to 100 feet (20 - 30 m), with a straight trunk. Bark is thin, smooth and gray for quite a long time, later becoming gray-brown and longitudinally furrowed. Shoots radiate in all directions, are about 0.04 inch (1 mm) in diameter, and round or quadrangular in shape. Leaves are scale-like, decussate, small, ovate, obtuse, dark green, with a dorsal gland in the shape of longitudinal furrow. Pollen cones appear early in spring. Seed cones grow on a short stalk, glossy, brown to gray in color, pendulous in nature, globose to elliptic in shape. They are 0.8 to 1.2 inches (2 - 3 cm) long, composed of 8 to 14 opposite scales, with concave to flat apophysis, with a small central umbo and a point. Seeds are found in clusters of 8 to 20 to each fertile scale. They are brown in color, flattened, minute, without resin blisters, and narrowly winged. Cones begin to open in September. 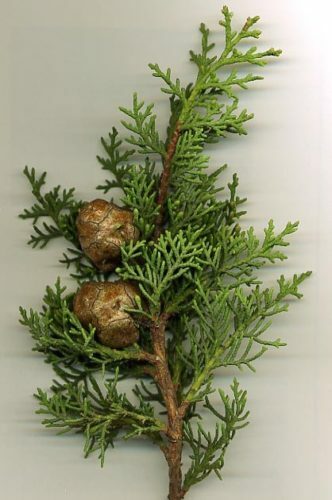 After shedding the seeds, the cone persists on the tree for several years because, as with many species of Cupressus, C. sempervirens displays varying levels of serotiny: cones may remain unopened on the tree for many years until a fire induces them to open and subsequently to shed viable seed. map by By Giovanni Caudullo, Gianni Della Rocca - Caudullo, G., Welk, E., San-Miguel-Ayanz, J., 2017. Chorological maps for the main European woody species. Distribution. This species is native to Greece (some Aegaean islands), Turkey, Crete, northern Iran, Lebanon, and Syria; and perhaps Cyprus (which would only be appropriate). In northern Africa, it may be native to Tunisia and northern Libya. Currently, it can be found growing in cultivation or locally naturalized throughout the entire Mediterranean region. The species is also tolerant to drought, air currents, wind dust, sleet and atmospheric gases. Its root system is well developed. It succeeds on acid and alkaline soils. According to studies by Tucovic (1956), and Raddi and Panconesi (1989), Mediterranean cypress is tolerant of temperatures as low as -4ºF (-20°C) , but Bannister and Neuner (2001) rate it hardy only to USDA Zone 7 — cold hardiness limit between 14º to 10ºF (-17.7° and -12.2°C). Attribution from: Mirko Vidakovic; . Conifers: morphology and variation; translated from Croatian by Maja Soljan; ©1991, Croatia: Graficki Zavod Hrvatske. Cupressus sempervirens — a closeup of foliage and seed cone detail. 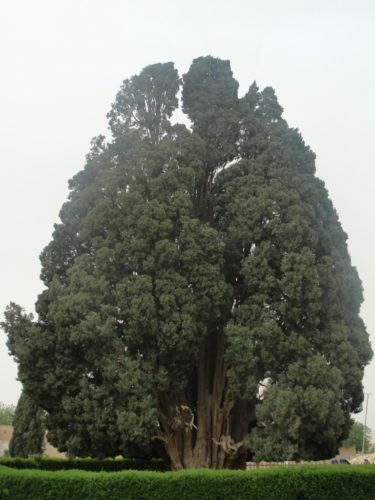 4000-year-old Mediterranean cypress of Abarqu, Iran. Fastigiate Mediterranean cypress (Cupressus sempervirens 'Stricta'), planted in Hawaii.